Welcome to our Prince Shop, Maurice Robinson Sports is the UK's one stop shop for Prince rackets sports equipment. We offer prince tennis rackets such as the Prince EX03 tennis racket range, along with Prince tennis clothing, tennis shoes and other Prince tennis equipment. We also stock Prince badminton rackets and everything else Prince badminton related. 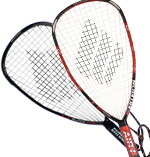 If squash is your game then you will be happy with our selection of Prince squash rackets and squash equipment. We also stock Ektelon racketball rackets and other Prince Ektelon racketball equipment. Yonex Voltric Z-Force 11. Fantastic new racket from Yonex. An easier to use and more forgiving version of the Z Force, the Z Force 11 was used by Lee Chong Wei to win the Yonex All England 2014 Mens Singles. A great racket for the attacking player who is looking for both power and control. Our Rackets Manager, BE Level 3 Coach, Andy Hartley play tested the racket this week and in his opinion, this is the best racket ever produced by Yonex and it is now his racket of choice. The racket works totally in harmony with your racket hand. Please ring us for personal advice on string choice and string tensions 0121 444 3021. The revolutionary new way to smash. A TOTALLY BRAND NEW FRAME Nanoray 900 suppresses the angle of the shuttlecock for a completely new angle to your smash shots. The latest head-light series from YONEX, NANORAY provides a fast and controlled swing with enhanced repulsion via the New Aero Frame. NANORAY is designed for players who force their opponents into the back of the court with extreme speed. The thinner top of the frame sides minimize air resistance for greater head speed, while the thicker sides at the bottom of the head generate maximum repulsion through greater frame stiffness. Shop for tennis, squash and badminton rackets by department. Shop for tennis rackets, badminton rackets and other racket sports equipment by brand. Maurice Robinson Sports is a dedicated racket sports specialist and we only stock quality brands and products from manufacturers we trust.